Walmart Stores is in advanced discussions to invest as much as $1 billion (Rs 6,647 crore) into Flipkart Online Services, as the two companies battle Amazon in the e-commerce space, according to a person familiar with the matter. Walmart, the world's largest retailer, would take a minority stake in Flipkart under the proposed agreement, the person said, asking not to be identified because the matter is private. Final terms of the deal have not been worked out and negotiations are still underway, the person said. Flipkart's most recent valuation was about $16 billion (Rs 1.06 lakh crore), according to research firm CB Insights. It is the largest online retailer in India, but its lead has been under assault as Amazon steps up investments in the country. Chief Executive Officer Jeff Bezos said in June he plans to spend another $3 billion (Rs 19,936 crore) in India to gain customers in the fast-growing market. A deal with Walmart would give Flipkart additional capital to fight back and more expertise in battling the e-commerce pioneer. "If the deal goes through, the competitive intensity between Flipkart and Amazon will shoot up," said Gautam Chhaochharia, the Mumbai-based head of India research at UBS AG. The deal has potential benefits for Walmart too. Beyond any eventual financial return on its investment, Walmart would gain exposure to India's expanding e-commerce market and have the opportunity to challenge Amazon on more equal footing than the US. A spokeswoman for Walmart said she could not immediately provide comment. A Flipkart spokesman said, "It is our policy not to comment on rumours or speculations." India is the next big potential retail prize after the US and China, where foreign players have made little progress against Alibaba Group Holding. India's online market will expand at an average of 45 per cent annually in the next four years and reach $28 billion (Rs 1.86 lakh crore) by 2020, according to estimates from Kotak Institutional Equities. Walmart had earlier established a retail joint venture in India with Bharti Group, which runs the country's largest telecommunications operator Bharti Airtel. But the business failed to take off and Wal-Mart eventually sold its stake to its partner. If a Flipkart deal materialises, Walmart would be able to support its new ally with money and its decades of retail experience. 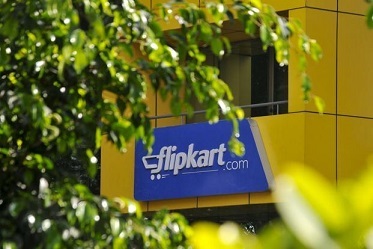 "With its main competitor Amazon getting aggressive, Flipkart needs a solid partner to bolster its operations with not just capital but also branding, logistics, sourcing and other retail experience, they won't be able to pull it off with small partners," said Devangshu Dutta, chief executive officer of the Gurgaon-based retail consultancy Third Eyesight. Amazon has been gaining with major investments in infrastructure and partnership. The company has committed a total of $5 billion (33,227 crore) to the India market, including the latest pledge from Bezos. "They know how to work against competitor Walmart, they will know what to expect," Chhaochharia said. Walmart has been renewing its efforts to battle Amazon online. In August, it agreed to buy Jet.com for about $3.3 billion and put founder Marc Lore in charge of the combined company's online operations. A tie up with Flipkart may prompt moves from other competitors in India. Alibaba has been funding Snapdeal.com, the third-largest competitor in Indian e-commerce, and has long considered the country a prime expansion opportunity as it seeks to generate half its revenue from outside China. But with Amazon and Walmart both stepping up investments, Alibaba may have to consider doing the same, either with Snapdeal or on its own. In Alibaba's most recent post-earnings conference call, Vice Chairman Joseph Tsai told analysts that India was a prized market where his company has investment in Snapdeal as well as an online payments service and mobile browser. "We're very well strategically positioned in these emerging markets, and that's the start of our international activity," he said at the time.